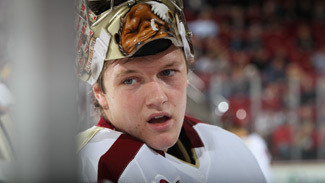 Thatcher Demko is a goaltender playing his freshman season with Boston College. The 6-foot-3, 190-pounder played his minor hockey in southern California before joining the U.S. National Team Development Program last season. Demko has offered to maintain a monthly blog for NHL.com that will chronicle his season leading up to the 2014 NHL Draft. This has been a crazy month. The team has been progressing great and we still have a lot more potential to works toward. We had a bit of a slot start to the season, but since the start of November we’ve been real good. We won our first five games to start the month, and we’re 4-1-1 on the season in the conference, so that’s been a good thing. I unfortunately suffered a minor hamstring strain after my last game against Boston University. I was out for three weeks but I am back in full swing now. This past month was full of rehab and wishing so desperately to be on the ice, but I sure am glad to be back. We have two more games until our Christmas break. We play the University of New Hampshire twice this weekend, home and away. Hopefully we can get four points and use that momentum to the second half of the year.